Now that winter is over, it’s time to freshen up your house for the spring and summer months ahead! 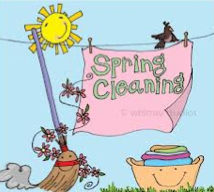 Spring cleaning is a time to declutter, organize, and clean the areas of your home that need a little extra TLC. Before you begin cleaning, it’s a good idea to get rid of any clutter you don’t need. Organize the things you want to keep and box up the items you don’t. Donating the items you want to get rid of is a good idea or you can plan a garage sale. Although we may h ave a tendency to hoard during the wintertime, we are generally ready to get rid of clutter once spring arrives. There are some chores that get done seasonally because we ignore them during the winter and fall; now it’s time to bite the bullet and flip the mattress and vacuum the home. The springtime is also a nice time to open up the windows and air out your home. Getting your family involved is a great way to bring everyone together and tackle the workload. Throw some music on or offer a family treat once the chores are done. The key to maintaining your spring clean home year round is to avoid the “I’ll just put this here for now” lifestyle. Put your clothes away as soon as you’re done with laundry; hang your jacket when you enter the house. Take the extra minute to clean rather than spending an hour during your Saturday. Clutter accumulates easily because things pile up. A great way to keep rooms tidy is to go through with a basket and collect everything that doesn’t belong in the room at the end of the day. Empty the basket’s contents each day or week depending on the amount. Once you spring clean, there will be a natural rhythm to keeping your home clean and you will have more free time on your hands.